Every now and then if my partner and I finish work relatively late, and don't have the energy to cook, then we'll pay a visit to Canton Noodle House in Burwood. We've continued to go there ultimately for two reasons. Firstly, the food is good and secondly you receive great value for money. I wouldn't say the place has fantastic views or that you will receive five start service, but when we do visit we enjoy the tasty dishes and large helpings. Located in the Burwood city centre, there are a number of similar restaurants but after trying a couple of the others we usual find that we end up back at the Canton Noodle House. The last time we visited, we ordered an entree of spring rolls to share. My partner and I believe the spring rolls are comparable to some of the best spring rolls (add link to article) in Sydney. 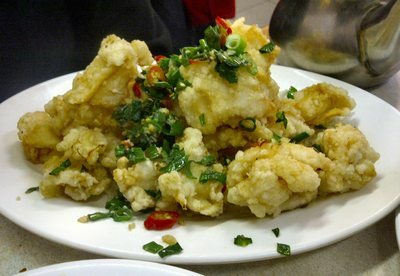 My partner ordered her favorite dish, Salt and Pepper Squid as she usually does, but this time she also ordered an Iced Mango drink to go along with her meal which looked delicious. The feedback she gave was the Iced Mango was just want she needed and that Salt and Pepper Squid met her expectations as it always did. Usually I'm a big curry beef fan, but decided to order something a little different last time I visited. 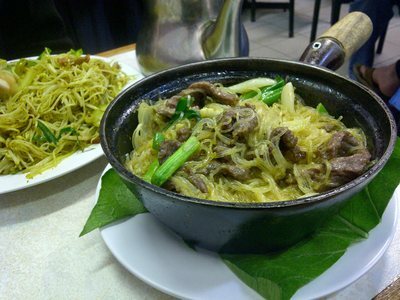 Opting for the Satay Beef Hot Pot with Clear Rice Vermicelli as well as Singapore Noodles to share was the right choice. The beef was tender; the food was tasty, with just the right amount of chilli that I like. I believe I may have found my new favourite dish at the restaurant. Canton Noodle House is a great little restaurant that is constantly busy, with a high turnover of clients which keeps the service fast and the food fresh. It may not be everyone's cup of tea, but it is a place that I always enjoy visiting when I feel particularly hungry.